Why is double my half-equivalence point not equal to my equivalence point? Tris pKA = 8, therefore at pH = 8, the volume is 4.5mL. 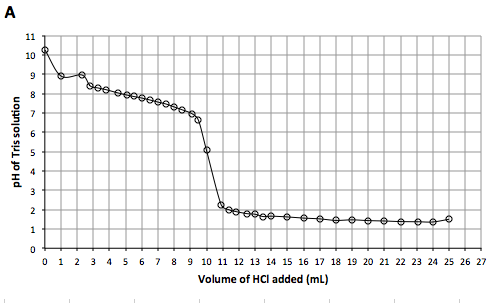 However the equivalence point simply can't be at 9mL, looking at this graph. It should be between approximately 9.5 and 10.5, no? Browse other questions tagged titration or ask your own question. Shouldn't the pH at the equivalence point always be 7? Is this asking for the equivalence point? How can a conductivity meter be used to determine the equivalence point? Would the End Point and Equivalence Point be Labelled the Same?